Jack recounted his Ohio Open experience in a 2017 AARP magazine article, “The Coach that Celebrities Will Never Forget”. 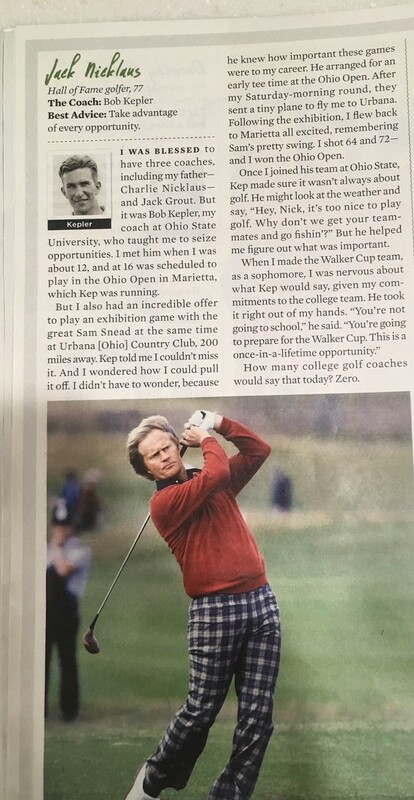 He gave praised his Ohio State golf coach Bob Kepler. He taught Jack "to seize opportunities" and helped him "figure out what was important." No problem. Fortunately, Bob Kepler was involved in running the Open tournament. He arranged for an early tee time and a private plane to fly Jack to Urbana for the exhibition match. When he arrived for the exhibition, he was intimidated by the crowd, which appeared to be "thousands of people." He recalled "I'd had first-tee jitters before but nothing like the nervousness that struck me this time...there was nowhere to run and hide." Jack was mesmerized by Sam Snead's smooth effortless golf swing. As the round progressed, he found that his own swing began to take on that smooth tempo. Jack said that Snead couldn't have been nicer - except for calling him "Junior." Jack Nicklaus returned to Marietta for the final two rounds of the Open. With Snead's swing in his muscle memory, Jack shot a 64 in the third round, tying the course record at Marietta Country Club. He finished the final round with a 72 to win the Ohio Open. The victory was special for Jack because he won as an amateur, outscoring professional golfers. He gave credit for his win to Sam Snead, overlooking all those times Sam called him "Junior." It also brought him recognition beyond the Columbus area for his golfing accomplishments. Jack was known by "Jackie" at the time. Note the small headline at the top: "Blond links 'baby' wins." Article copy provided by Dan B. Cawley, Jr. There was another amateur who outscored the pros: Dan Cawley, then 39 years old, who had been Marietta Country Club champion multiple times. He was two strokes back with a 284 total score. 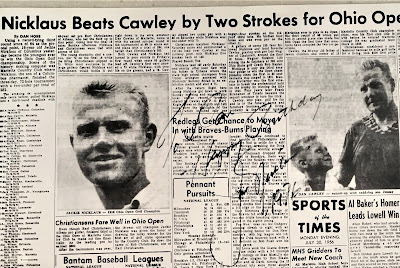 It was Cawley's course record which Jack Nicklaus equaled in the third round. Other Marietta golfers who finished in the final 36 participants included: Bob Murray, Bob Bisciotti (then MCC club pro), Bill Fenton, Bernie Wentis, Chick Engle, and Carl McQuilken. Dan Cawley was pictured in a Marietta Times article about the Open victory with his son Jim who caddied for Dan. Jim went on to become an MCC club champion who also broke the old course record with a 62. Jack autographed a copy of the Marietta Times article for Dan in 1976. Jack Nicklaus 1976". Document provided by Dan B. Cawley, Jr. The 1956 Ohio Open victory was a milestone in Jack Nicklaus' storied golf career. It happened at Marietta Country Club. And, to Marietta's credit, the Open also showcased the considerable local golf talent.